Major world automakers have already invested heavily in electric vehicles and related technology – and they are committed to keep doing so. Some have even promised to stop producing vehicles that run only on gas or diesel fuel in the future. The changes to the auto industry demonstrate the growing number of buyers willing to spend more money on environmentally friendly cars. But one of the main issues with the technology is that drivers need to charge the batteries often to be able to travel longer distances. The batteries themselves can also greatly increase the price of the vehicles. They can also be very costly to replace. Now, a new technology is being developed and tested in Sweden to help resolve these issues. Engineers there have created what is thought to be the world’s first operating electrified road. A Swedish company, Elways, invented the technology. The project, involving several companies, is called eRoadArlanda. 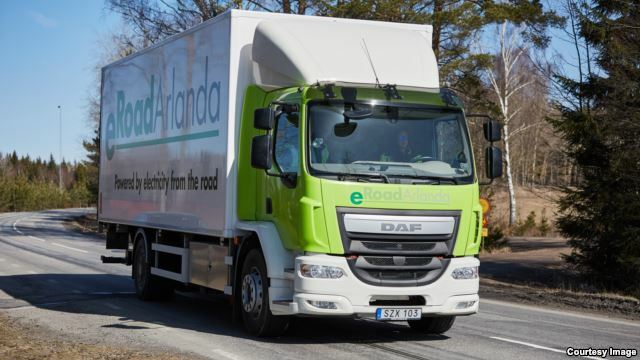 A large, specially built electric truck transports goods along a two-kilometer-long stretch of road from Stockholm’s Arlanda airport. The truck’s battery is charged from the electrified road as it travels. 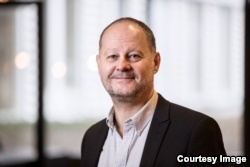 CEO Hans Saell has led the project since 2013. He explains that the technology works in a simple way. A 15-centimeter-wide electrical rail is built into the road. The vehicle contains equipment that automatically senses the electrified road. An arm then lowers from the vehicle to make contact with the rail. Saell says the system is designed to make continuous charging on the road effortless for the driver. He says that currently, the battery makes up about half the total cost of a 100-percent electric passenger vehicle. Saell says being able to charge vehicles on the road can also remove fears drivers may have about going too far and running out of power. He says the system can be built into existing roads to reduce costs. He estimates that putting in a highly developed version of eRoadArlanda’s technology would cost about 1 million dollars per kilometer. That amount sounds like a big number and could add up fast over thousands of kilometers. But Saell says the cost is still a lot less when compared to other transportation infrastructure projects. He added that the vehicle equipment also costs much less than systems that would require electrical equipment above ground, such as railways or street cars. Project leaders say the electrified road has been tested in all kinds of weather and even proved effective in snow and ice. Saell says the powered road is also safe because the electricity is below the surface and well covered. The road is also not electrified all the time. The electricity turns on in 50-meter stretches only when an equipped vehicle is traveling on the road. Saell says the eRoadArlanda system still needs a lot of development before it will be ready for wide industrial use. But he estimates this could happen in just 5 to 10 years. Another company experimenting with road charging technology is the wireless company Qualcomm Technologies Inc. The company has developed and tested a system called Halo, which involves wireless charging. Qualcomm has already been developing wireless solutions for charging stations at homes, workplaces or public spaces. The technology uses ground-based pads to wirelessly charge vehicles parked over them. The company has said this type of charging system can also reduce the need for large, costly electric vehicle batteries. But now the company has gone further to extend its Halo technology to what it calls “dynamic charging.” This gives vehicles the ability to wirelessly charge on the road. Qualcomm says the system is designed to wirelessly charge a driving vehicle at up to 20 kilowatts at highway speeds. After thousands of hours of testing, the company demonstrated the technology last year during a 100-meter-long road test in France. Two vehicles were shown during the demonstration to be able to charge on the same road at the same time. And, the system worked whether the vehicles were traveling forward or backwards.